This figuren2, from a medieval Hebrew calendar, reminded Jews of the palm branch (lulav), the myrtle twigs, the willow branches, and the citron (etrog) used during the holiday of Sukkot. According to the Book of Exodus, Jews have been using a lunisolar calendar since the time they left Egypt. The first commandment the Jewish people received as a nation was the commandment to determine the New Moon. Very soon after that, the Jews received the commandment to make sure that Passover falls in the spring. In the Tanakh (the Hebrew Bible), the months are usually numbered rather than named. (See table below.) Only four month names appear in the Tanakh from before the Babylonian Exile (see table). The month names of the modern Hebrew calendar were taken from the month names in the Babylonian calendar during the Babylonian Exile (6th century BCE). At first, a new month began when witnesses came to the Sanhedrin (high rabbinical court) and testified that they saw the new crescent moon in the sky. The Sanhedrin also decided when an extra month should be added to the calendar to keep Passover in the spring. (See Metonic cycle.) After the destruction of the Second Temple in 70 CE, it became harder for the Sanhedrin to meet and hear witnesses. For that reason, the Sanhedrin established a fixed, rule-based form of the calendar. Maimonides fully described the modern Hebrew calendar around the year 1178 CE. 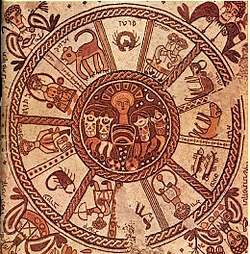 In the modern Hebrew calendar, years are counted as Anno Mundi (Latin for "year of the world"). This represents the traditional count of years since the creation of the world as described in Genesis. This year is anno mundi 5779. In the small Karaite Judaism community, the calendar is very similar. However, Karaites use witnesses to set the date of the new crescent moon. They still use the ripening of barley to decide whether to add an extra month to the year. For those reasons, the Karaite calendar can be slightly different from the main Jewish calendar. In the Hebrew calendar, the meaning of day is taken from the Hebrew Bible: "And there was evening and there was morning, one day". Because "evening" comes before "morning", a day in the Hebrew calendar starts in the evening. For many purposes, the day in the Hebrew calendar begins at sunset. But when it is important to make sure the previous day is completely over, the day begins at nightfall. People who print calendars, or who write calendar programs for computers, ignore that rule. They treat the Hebrew calendar date and the Gregorian calendar date that has the same midnight as being the same day. They assume that people reading a Hebrew calendar know the sundown rule. Whenever a holiday, birthday or anniversary appears on a printed calendar, it actually begins on the day before, at sundown. The calculation of the Hebrew calendar year and month start with the molad. Molad is a Hebrew word meaning "birth". The word refers to the "birth" of the new moon each month. The modern Hebrew calendar uses a calculated molad: the average length of the cycle from new moon to new moon over many years. The length of the molad is 29 days, 12 hours, 44 minutes, ​3 1⁄3 seconds. A year of 12 lunar months would be 354 days long; but a Hebrew calendar year must be a solar year—about 365 days long. Also, a Hebrew calendar year must have either 12 months or 13 months. It is not allowed to have "part" of a month, so a thirteenth month is added seven times in every cycle of nineteen years. This is an adaptationn 2 of the Metonic cycle, a calendar cycle that was well-known in ancient times. By conventionn 3, the Hebrew calendar adds the extra month during years 3, 6, 8, 11, 14, 17 and 19 of the cycle. Postponing Rosh Hashanah if the time of the molad (in Jerusalem) is after 12:00 noon. If not for this rule, Rosh Hashanah would be the day before the molad in parts of the world east of Jerusalem. Postponing Rosh Hashanah so that it does not start on Sunday, Wednesday or Friday. This rule prevents Yom Kippur from being the day before or after Shabbat. It also prevents Hoshana Rabba, the seventh day of Sukkot, from being on Shabbat. Once Rosh Hashanah for this year is calculated, the Rosh Hashanah for next year is calculated, starting with the time either 12 or 13 molad periods in the future. Once the dates for this year's and next year's Rosh Hashanahs are known, calculating the calendar in between is easy. When the extra month is added, it is month six (counting from Tishrei), and always has 30 days. When the number of days between this Rosh Hashanah and next is 355 days in a regular year (or 385 days in a leap year), an extra day is needed. It is added to Heshvan (month two counting from Tishrei), which then has 30 days. When the number of days between this Rosh Hashanah and next is 353 days in a regular year (or 383 days in a leap year), one fewer day is needed. It is taken away from Kislev (month three counting from Tishrei), which then has 29 days. The calendar calculations are based on the average length of a moon cycle. The actual length of individual moon cycles varies over time. The rules for postponing Rosh Hashanah (see above) push Rosh Hodesh away from the astronomical new moon. The people who created the calculations decided having Rosh Hodesh close to the new moon was less important than other factors. ↑ 1.0 1.1 Exodus 12:1-2: "This month is the first month for you". ↑ Deuteronomy 16:1. "Spring" refers to northern hemisphere spring. ↑ 354 + ​7⁄19 * 30 ≈ 365. This is an example; the exact rules are more complicated. ↑ 4.0 4.1 See Exodus 13:4. ↑ Ancient Israel: Its Life and Institutions (1961) by Roland De Vaux, John McHugh, Publisher: McGraw–Hill, ISBN 978-0-8028-4278-7. ↑ The Islamic calendar, which is lunar, still uses a similar procedure today. ↑ The Code of Maimonides (Mishneh Torah), Book Three (Book of "Times" or "Seasons"), Treatise Eight: Laws of the Sanctification of the New Moon. See reference below. ↑ Particularly, aviv means "the [season of the] ripening of barley" (Exodus 9:31). ↑ 12.0 12.1 These can change because of technical calendar rules. See Calculating the calendar above. ↑ "The Jewish Day". Chabad.org. Retrieved 11 May 2016. ↑ Based on Genesis 2:1-3. ↑ See, for example, Calendar in Hebrew (from he.chabad.org). ↑ Bromberg, Dr. Irving. "Moon and the Molad of the Hebrew Calendar". Retrieved 19 May 2016. ↑ Jacobs, James Q. "Eclipses, Cosmic Clockwork of the Ancients". Retrieved 19 May 2016. ↑ Bromberg, Dr. Irving. "The Purpose of the Hebrew Calendar Rosh HaShanah Dehiyyot (Postponements of the First Day of Tishrei)". Retrieved 19 May 2016. There are actually a total of four postponement rules. The other two are very rare. They are used to make the year the right length in days. Bonnie Blackburn and Leofranc Holford-Strevens. The Oxford Companion to the Year: An Exploration of Calendar Customs and Time-reckoning. Oxford University Press; USA, 2000. pp 723–730. The English of these sites may not be Simple English. This page was last changed on 28 March 2019, at 11:08.